Abdel Fattah Al-Sisi officially declared Egypt’s new president as final results show him winning more than 96 percent of the vote. Egypt’s former defense minister Abdel Fattah Al-Sisi was officially declared Egypt’s new president on Tuesday, as final results from last week’s vote found him winning more than 96 percent of the vote. Gulf News reported that the Egyptian election commission said that Sisi had gained 23.7 million, or 96.1 percent of the valid votes cast in the polls, Egypt’s first since the army ousted Islamist president Mohammed Morsi last July. Sisi’s sole challenger, Hamdeen Sabahi, secured 757,511 or 3.9 percent of the valid votes, the commission’s Chairman Anwar Al-Aasi said in a televised statement. Around 47.45 percent of Egypt’s 53.9 million eligible voters cast their ballots in the three-day election, Al Aasi added, according to Gulf News. While admitting defeat, Sabahi had questioned the credibility of the voter turnout figure, but the elections commission rejected his appeal against the voting results. Al Aasi said the commission extended the scheduled two-day voting for an extra day in response to a heat wave that hit Egypt at the time of the polls and might have discouraged the electorate. According to him, 10 percent of the total voters, who showed up at the polls, cast their ballots on the third day. “Increasing the number of polling stations helped elections to run smoothly and result in a high percentage of voting,” Al Aasi said, according to Gulf News. “With this election, the Egyptians have endorsed their constitution and elected their president. What remains is electing the parliament,” he added, referring to an army-backed transitional roadmap announced following Morsi’s removal. Meanwhile, Sisi’s supporters took to the streets nationwide celebrating his overwhelming victory. They rallied to the iconic Tahrir Square in central Cairo, waving his pictures and the national flag. In other areas of the Egyptian capital, revelers honked their car horns and set off fireworks in celebration. Residents of Sisi’s hometown in the Cairo medieval quarter of Al Jamiliya danced en masse as they held his portraits. 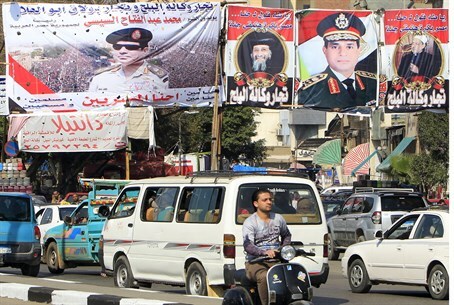 It is hoped that Sisi’s election will bring about a calm in Egypt, though former Israeli Ambassador to Egypt Tzvi Mazel predicted last week that Sisi will have a hard time putting the country in order.